I was privileged to serve as Director of the Communication Research Center (CRC) at Boston University from 1994 to the end of December 2015. Here are some reflections about the evolution of the CRC from 1959 to 2015. 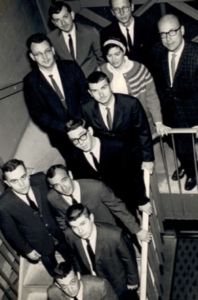 The CRC was first established as part of Boston University in 1959. From its launch and throughout the 1960s and 1970s, researchers affiliated with the CRC made pioneering contributions to the body of knowledge about the effects of television on children and other salient issues of that era. Ninety-one married male subjects with children were assigned to one of six experimental conditions, involving exposure to taped messages on the Civil Defense fallout shelter programs, varied in terms of high and low anxiety appeal directed at the subject, his family, and “members of society in general.” As in earlier studies, high anxiety appeals were found less effective than low anxiety appeals when these were directed at the subject himself, but high anxiety appeals were found more effective when directed at the subject’s family. The study was directed by Professor Frederick A. Powell, and is fully reported in Communication Research Center Report No. IO. The Center has also announced the completion of two studies, directed by Daniel L. Griffin and Frederick A. Powell, of impact, readership, and reactions elicited among college student samples by a series of varied college newspaper advertisements of the Equitable Life Assurance Society of the United States. The studies involved certain departures in readership testing, and are fully reported in Communication Research Center Reports No. ii and I2” (pp. 158-164). “An Order-Effect Hierarchy” in Primary-Recency is a proposal for hierarchical classification of variables which have been shown “to induce primary or recency effect” in persuasive communication. Written by Ralph L. Rosnow, Robert F. Holz, and Jack Levin, the report is now in press for the Journal of Social Psychology and is available from the Center (CRC Report 13). Recommendations for Research Related to the Communication of Gerontological Information, written by F. Earle Barus for the Gerontology Branch, Division of Chronic Diseases, identifies problems in the title topic and proposes four research projects designed to study these problems” (p. 499). The Communication Research Center (School of Public Communication, Boston University, Boston 02215) has announced the completion of a study entitled “One-sided versus Two-sided Communication under Indirect Awareness of Persuasive Intent. The study deals with whether “subjects in a laboratory opinion change study might become aware of an experimenter’s persuasive intent even in the absence of an explicit forewarning, and, if they should become aware, whether their opinions would be manifested any differently after exposure to a one-sided as opposed to a two sided persuasive communication.” The Center has also announced completion and forthcoming publication of a study entitled “Consonant and Dissonant Communications as Positive and Negative Reinforcement in Opinion Change,” by John F. Corrozi and Ralph Rosnow, and of a study on the effects of awareness in a “before-after opinion change experiment” by Robert F. Holz and Ralph Rosnow” (p. 501). Sometime in the 1980s, CRC research activities ceased and the reasons for this are not very clear. Upon my arrival to BU in 1993, I noticed that the sign outside the College of Communication main building located at 640 Commonwealth Avenue listed the various academic departments housed within, and among them it listed “Communication Research Center”. When I inquired about how I could get involved in the CRC, I was told by then-Dean Brent Baker, who had recently arrived at COM, that it was news to him that such an entity existed in the College of Communication. Dean Baker encouraged me to investigate the history of the CRC. I discovered that not much in terms of CRC history was left behind by its prior administrators who had themselves departed many years prior to my arrival. As I set out on a mission to assemble whatever historical pieces existed about the CRC, I was asked by the Dean to investigate the possibility of re-launching it. In mid-1993, I put together a proposal for relaunching the CRC. In 1994 I was formally appointed as Director of the Communication Research Center and confirmed by the Boston University Board of Trustees, though there was no compensation for this position. My journey as Director of the Communication Research Center began with the creation of a dedicated space for the CRC. I envisioned the space to consist of a computer lab that was also a telephone survey calling center, a hub for quantitative data analysis, and a conference room for research teams. Dean Baker asked me to propose the creation of this space to the COM alumni board. And the alumni responded positively by donating a total of $50,000. This gift led to the purchasing of 6 computers and the allocation and renovation of a then-office located in the 640 Commonwealth Avenue building (the same space in recent years began being used as the COM faculty/staff coffee lounge). 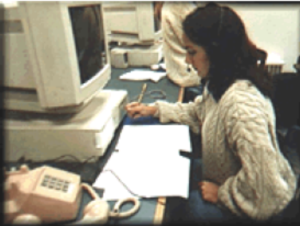 In 1994, this office got equipped with desks and chairs and I personally installed the 6 computers and their corresponding servers in what became the physical space of the relaunched Communication Research Center. For 4 years, the CRC consisted of myself and a few master’s degree students who were interested in learning about research. We took on numerous research projects, both academic and applied, ranging from predicting the influence of political advertising on voting behavior, to understanding the motivations of whale watchers and their preconceptions about the National Marine Sanctuary program. We also took on BU-related research projects, for example, we analyzed BU’s very first alumni satisfaction study conducted in 1998. During that period of time, in parallel with my work at the CRC, I was teaching a full load of graduate research methods at COM. One of the graduate students who had been assisting me on the various research projects taking place at the CRC received a job offer from an industry that was not previously on my radar screen. The company making the offer was Chadwick Martin Bailey and the industry to which it belonged was “marketing research”. The offer my graduate student received was 35% higher than Communication-based job offers previously acquired by our graduate students. I quickly learned that the marketing research industry was having a difficult time finding qualified employees, and the training that the graduate students were receiving at the CRC was equipping them with the types of knowledge and skills that the marketing research industry greatly valued. As a result of this new realization, I proposed and in 1997 got approval for a new academic concentration within the Department of Mass Communication, Advertising and Public Relations: Applied Communication Research. This concentration was primarily focused on providing students with the knowledge and skills needed for jobs in the marketing research industry. With the encouragement and backing of Dean Baker, I proposed the expansion of the CRC to the then-Provost of Boston University. The Provost enthusiastically supported my plans by allocating the then-vacant basement of 704 Commonwealth Avenue and awarding me an internal grant of $500,000 for the construction of a new Communication Research Center. I was allowed to design a research center from scratch with the assistance of architects hired by BU. The 704 Commonwealth Avenue basement was gutted, the floors were jack hammered and a new research center got built. I oversaw the construction process of the new space of the CRC on a daily basis. 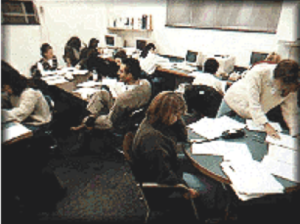 The new CRC consisted of a 30-station telephone survey research lab with remote monitoring capabilities, a server room, a state-of-the-art focus group facility that also doubled as a small group research lab and a web-interface laboratory, a kitchen, a reception area, administrative offices, and bathrooms. In addition to the state-of-the-art tools used for the collection of computer-assisted telephone survey interviewing, the CRC also housed a custom-built first-of-its-kind eye-tracking machine that did not involve any headgear attachment and allowed unobtrusive measurement of eye gaze and pupil dilation while watching media content. Additional tools included a machine that allowed researchers to capture the electrodermal response and other such physiological measures stemming from exposure to mediated messages. In the year 2000 we inaugurated the new state-of-the-art space of the CRC at 704 Commonwealth Avenue. The position of Associate Director was created and I asked my then-colleague Dr. Kumiko Aoki to fill it. From the year 2000 and until 2002, while still teaching a full load of classes, I embarked on an experiment in CRC funding by adopting a research company-like operations model. The influx of research contracts to the CRC led the then- Provost to allocate an operational budget for the CRC. This operational budget covered a modest stipend for me and full salaries for two full-time staff members consisting of a contract administrator and a project manager. I spent endless hours securing research contracts and then carrying out research projects that rivaled those conducted by large commercial research organizations. I also continued to do the type of academic research that was facilitated by having a newly expanded CRC. One of the studies that we conducted during this period of time was among the first to investigate the benefits of using web surveys, a mode of data collection that was recently introduced. The report stemming from this study was published in the proceedings of the American Statistical Association: https://www.amstat.org/sections/srms/proceedings/ papers/2000_159.pdf). Another study that we conducted was among the first to develop a structural equation model of the process involved in web shopping. Web shopping was, at the time, a newly introduced means for consumers to shop. The CRC was also commissioned by the Office of the Provost to conduct BU’s first Freshmen retention study. I designed the study, my team conducted a literature review of student retention, we identified predictors of student dropout, and we developed survey measures that captured the various predictors. Through the CRC survey lab we conducted a telephone survey of students who had dropped out from BU. The data was analyzed and the results pinpointed the factors that influenced a Freshman’s decision to drop out from BU, described the characteristics of Freshmen students who are most prone to dropping out from BU and detailed the sequence and timing of events that typically precede a student’s decision to drop out. This information was used for developing early intervention programs that would increase Freshmen retention. The CRC also conducted a customer satisfaction analysis for what used to be called “Sargent Camp”, a BU-affiliated outdoor facility in New Hampshire that encompassed buildings suitable for department retreats and outdoor team building exercises. As was the case for the Freshmen retention study, all phases of research resulted in the pinpointing of those clients most satisfied and those least satisfied with the services provided by “Sargent Camp” and potential clients whose needs are currently unmet by “Sargent Camp’s” competition and who could thus be served by “Sargent Camp”. A consulting project undertaken at the CRC during that period of time exemplified the type of innovation that can be achieved by bringing together researchers from various disciplines and having them focus on the same problem and the efforts that I exerted to involve researchers from academic units from across the BU campus. The problem in this case was trying to explain what determines the success level of new product launches. The client for this project was Schneider PR. The study began with a literature review of the factors that were found to affect product launches, this was followed by the development of customized measures that captured the variation of each construct that was identified in the literature review, and the carrying out of a hybrid mail/web survey of vice presidents of marketing at hundreds of companies. After obtaining the survey data, I engaged the services of a faculty member from the Department of Mathematics to do the mathematical modeling and a faculty member from the Computer Science division of Metropolitan College to help develop a software simulator. The simulator allowed the user to interface with the mathematical model by entering details about various aspects of a planned product launch and then simulating the likely success of a product launch based on all the things that this user anticipated doing in preparation for the launch. The simulator not only gave the user the likelihood for the product launch to succeed, but also allowed the user to change what they anticipated doing in order to increase the chances that the launch will succeed. As end of project deliverables, Schneider PR received a technical report about the factors that affect the success of product launches, including the derived mathematical model, and a software application that allowed Schneider PR to help its clients simulate the outcome of the launch efforts that they are planning. Joan Schneider and her colleague Jeanne Yocum subsequently released a book partially based on the findings of the study that we had conducted for her: New Product Launch: 10 Proven Strategies. Two years after I began my experiment of running the CRC as a business-like operation, I realized that there was a significant mismatch between the pace needed to run a business-like operation and the pace at which a university operates. While the business-like operation needed to be running in sprint mode, the pace of all support services within a university ran at turtle speed. I thus came to the conclusion that a business-like operation was not a good fit inside a university setting. In 2002 I informed the then-Provost that the business model experiment that I had initiated needed to end as it was not sustainable. The Provost agreed with my assessment. The CRC’s operational budget was discontinued thus ending the modest stipend I was receiving, also ending the presence of the 2 full-time staff members, and the CRC’s new mission became solely focused on educating students and fostering faculty research. This same mission of educating students and fostering faculty research remained until my resignation in 2015. To facilitate survey research at COM, in 2010, with the support of then-Associate Dean Tammy Vigil, I applied for and I received in 2011 a unique blanket authorization (a master protocol) from the Charles River Campus Institutional Review Board (IRB). This authorization allowed the creation of a first-of-its-kind college-level research review board at BU: The COM Research Review Board (RBB). The RBB shrunk the review time of anonymous survey projects submitted by COM faculty and graduate students from upwards of 6 months to less than 1 week. My appointment as conference co-Chair of the 2013 World Association for Public Opinion Research (WAPOR) brought increased international academic visibility to the CRC. As the person in charge of the WAPOR conference of 2013, I brought the WAPOR conference to the BU campus and along with it hundreds of leading researchers from various disciplines and from all around the globe. I requested to change the name of the concentration in Applied Communication Research (ACR). ACR was the academic program that had stemmed from my work with graduate students at the CRC in the 1990s. The name change request underwent close scrutiny by various committees within BU but was finally approved. The new name beginning in Fall 2016 will become “Marketing Communication Research” a label that better describes what our students do after graduating. I requested that my colleague Dr. Mina Tsay-Vogel be appointed as Associate Director of the CRC. I resigned from the CRC effective December 31, 2015, thus ending my journey as Director of the CRC 21 years after it first began. The CRC journey continues with a new team of co-Directors: Dr. Mina Tsay-Vogel and Dr. James Cummings. They will undoubtedly evolve the CRC’s mission and take it in new and exciting directions.